i don’t have much to say about what are the roots that clutch, aside from that old cliché, ‘let the sounds speak for themselves’. like all my works, it was a long time coming, the first elements, the jars recorded with john grzinich, rocking back and forth in the wind on a since-dismantled metal walkway over disused oil tanks in the village of mooste, southeast estonia, dating back to 2006. other aspects and found sounds followed year by year: the room feedback techniques originally developed for live performance; the treatment of the ringing resonance of a parisien shower stall; the pleasure of sitting by a tartu frog pond on a spring evening; the ghostly and strangely musical mix of medium wave radio signals on a receiver in rural normandy; the powerful wind on a hilltop in forcalquier; the accidental windharp of a fence on the coast near dieppe; the collection of played found objects that brought such a different feeling of performance when i got tired of fiddling with field recordings. it wasn’t until this body of sounds and experiences found one another that the work felt complex and whole enough to be “finished”. and even after finishing a work, it usually takes me a year or so of putting away and coming back and relistening to really believe a piece is ready to be given to an audience. the title, i would like to clarify, was found through an exercise in purposeful coincidence. i have never been good with titles. after many months with no title for this work i decided to try a technique of direct association: i made a list of the sound sources used (wind frogs feedback snow bathtub radio owl jars fence stuff icepath) and launched an internet search. on the first page of results was a link to a quasi-religious blog with my title as its tagline, that somehow mysteriously had my entire list of sources scattered throughout one post. it took a long time to accept that is was ok to ignore the provenance of the phrase (that is, both personally – the discovered blog – and universally – t.s. eliot’s the wasteland) and to accept the gift of coincidence and the beauty of the words themselves. perhaps the span of time it took for this work to develop is also what makes it feel good to me – i don’t associate it with any one place, physical, mental, or temporal. it spans a stretch of recent personal history that includes several countries of residence, many different people and focuses, in short, many different homes. perhaps in what has been, until recently, a relatively rootless life, it is no coincidence after all that this work found its own title: what are the roots that clutch? parts 1, 3, & 5 are composed from found sounds, found objects, and live room feedback. parts 2 & 4 are unmanipulated found sounds from mooste (ee) & dieppe (fr), respectively. sebastien dupont, marina gavrjutina, emilia mello, laura naukkarinen, antti tolvi, and my parents. It was a cavernous tone that broadcast from a ventilator duct that inspired Patrick McGinley to begin collecting field recordings and working them into his slow-arc compositions. At the time when he heard that particular tone in that particular city at that particular time, he had no gear to recording device on hand. Over the next fifteen years (and counting) McGinley has eased into a peripatetic lifestyle, wandering the European countryside and forests (but never straying too far from the thrum and spark of civilization) in search of the same epiphany with his head rattled to the sound of a cavernous air duct. Around 1996, McGinley adopted the moniker Murmer for his compositional work; and though his work often steps into the quieter realm of sound construction, much of his field recordings and resultant compositions privilege interference and disturbances that occur within any given sound ecology. Those sounds could be the elusive tone from that ventilator, the polyrhythmic chorus of chirping frogs, the abstracted roar from an Arctic wind tearing across the Black Sea, or the metallic skree from a bowed antenna perched atop a Soviet-era observatory. What Are The Roots That Clutch marks McGinley’s first full album in nearly 5 years, but it marks an elegant continuation of his previous album We Share A Shadow. The five chapters of this album can’t easily be associated with any specific location; instead McGinley overlaps and crosshatches his field recordings and abstractions into acousmatic passages with ghostly, half-melodic qualities. Even the two unprocessed recordings of the album are impossibly complex in their accretions of sound. McGinley’s composed pieces embrace lithe, mysterious drones whose mossy, damp atmosphere perfectly situate with tactile crunches, tactile events, and signal noise generation. Eels and leaches would not be out of place in such an environment; but the subaquatic murk snaps into a hallowed manifestation of ritualized minimalism at the album’s finale — one that LaMonte Young and Angus Maclise might have conjured in 1968 with clattering percussive elements and a hypnotic blur of harmonic drone. How to associate sounds from different timbre & origins, and give them the strength & cohesion of the real capture while imparting them an increased value ? How to extract the sound pith from listening experiences to re-inject it afterwards in a sort of still more eloquent aural form ? Since 1996, Patrick McGinley has traveled the European countryside armed with a recording device to collect sounds that are ultimately woven into long-form constructions. On the hour-long What Are The Roots That Clutch, his first full album in five years and follow-up to We Share A Shadow, field recordings, which McGinley gathered between 2006 and 2010 in numerous locales, are threaded into slowly mutating compositional structures. The album includes five untitled parts, with one, three, and five composed from found sounds, found objects, and live room feedback, and the other two consisting of unmanipulated found sounds gathered from Mooste and Dieppe, respectively. Many of the sounds aren’t identified by kind or place of origin, and consequently the listener is left to guess at what is being heard as McGinley weaves the elements into stand-alone set-pieces that retain phantom ties to their origins. The eighteen-minute opening part swells rapidly into an intense tapestry of crashing waves accompanied by the persistent patter of a ticking rhythm. The waves recede, leaving in their wake frog-like croaks and grunts, faint bird chirps, and the shimmer of glassy tones. McGinley wisely lets the material unfold slowly and gives each episode enough time to make its mark before effecting a segue into the next section. In doing so, sounds emerge surreptitiously, such as the fire crackle that gradually forms a subdued backdrop to the glassy shimmer. The tempo of the opening part slows dramatically as it nears its end, and the overall volume likewise grows ever more quiet. In part two, the unusual sound design evokes the image of a dangling piece of scrap metal blown by a gentle breeze and scraping against a barb wire fence. Part three hews to a conventional narrative arc in having its industrial churn slowly build in volume and textural density until it peaks and the slow deflation of a denouement sets in. Emerging quietly from a mass of water noises, tings, and knocking sounds, the final track builds to a feverish pitch that’s like one of Einstein On The Beach’s twenty-minute ensemble pieces (minus Glass’s familiar cycling patterns). The piece explicitly shows how McGinley uses his raw materials in the service of a compositional design when four minutes in a climax occurs, after which the piece changes character dramatically and grows simultaneously more percussive and drone-like during an extended episode of clattering noises and a blinding harmonics. McGinley’s chosen a fitting alias in Murmer, judging from the generally understated character of What Are The Roots That Clutch. His field recordings- and found sound-based pieces do, in fact, breathe softly in a manner that can deemphasize the large amount of activity in play within a given setting. It’s notable, for example, that even the two unprocessed settings register as engrossing arrays of texture and design. What are the roots that clutch, what branches grow out of this stony rubbish? Son of Man, you cannot say, or guess, for you know only a heap of broken images …. T.S. Eliot’s words ring true in this Wasteland; although the dry stone (gives) no sound of water, the sound of water can still be extracted, as can those of fire and frogs, drawn from a parched earth, coaxed from their environs, scattered and re-gathered like Eliot’s heap of broken images, a fallen deck of cards, shuffled by happenstance, a modern reflection of John Cage’s I Ching manner of composition. In this project, planes and birds co-exist, although they may not have been recorded together. This is an experiment in sound management, a question not of taxidermies, but of seemingly unrelated, complementary tones. The whole thing started with a ventilator duct. Patrick McGinley (Murmer) fell in love with its sullen sound and wanted more. And so his quest began: hunting and gathering the finest of field recordings to throw into his toybox, a heap of sounds, yearning to be sorted through, individually recognized, cherished again. Little did these sounds know that they would be re-contextualized. What Are The Roots That Clutch tackles relation through juxtaposition. Dragged metal meets drone. Sleet meets signal noise. The crucial factor is not the who, what, where, when or how, but the with. What branches grow out of this stony rubbish? Branches of cold, dead leaves, impossibly appearing amid the mass of frequencies, stretching veins toward a sun that never rises. Natural, unnatural or hybrid? Only McGinley knows for sure; for the rest of us, this genome has not yet been mapped. 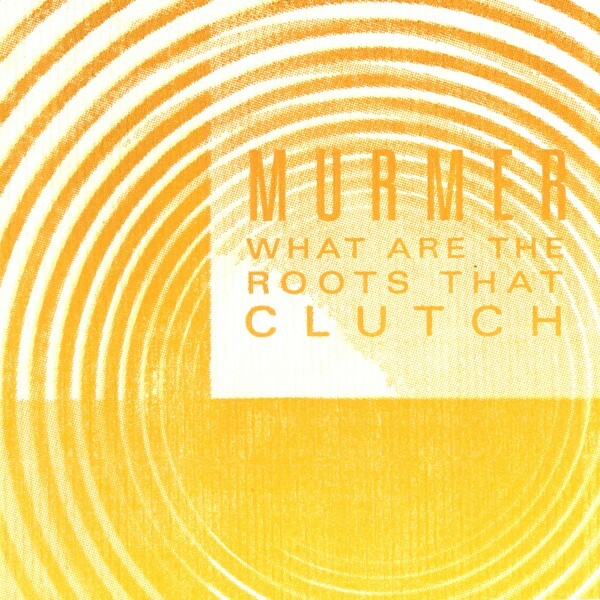 Murmer is the proper name for McGinley’s project; in the third movement, a gentle murmur surfaces, barely beyond the realm of comprehension, enough to make the listener lean forward. Is a message buried in the words, or hidden in the fluctuating timbres? By the closing piece, the rock has been overturned, and the artist’s quietude gives way to extremely active tones. Suddenly, the speakers are alive with chains, scrapes and melodic tones, a potpourri of immediacy. The broken images have been made whole. Voices (sing) out of empty cisterns and exhausted wells.